For drivers Jorg Bergmeister and Patrick Long, participation at Daytona with TRG is a familiar regimen. The Porsche factory driver duo co-drove to victory in the GT class last year with TRG. This year’s Grand-Am Series opener will be different, because they will be joined by Flying Lizard principal Seth Neiman and longtime Lizard regular Johannes van Overbeek in the cockpit. Lizard race engineer Craig Watkins and Crew Chief Tommy Sadler will direct the efforts of the No. 66 Porsche GT3 Cup entry and race strategist Thomas Blam will call the event for the Lizards. 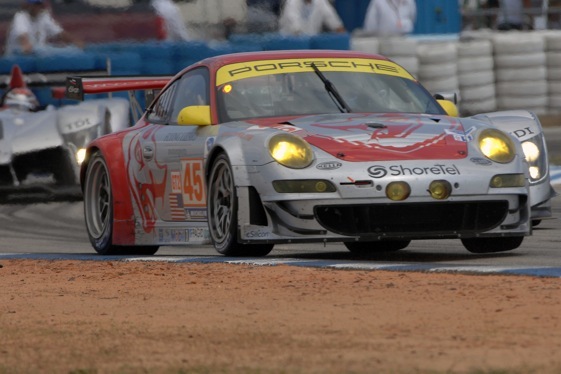 Flying Lizard Motorsports is no stranger to the Florida 24-hour. A 2004 Lizard entry started on the pole and finished second in GT and third overall with pole winner van Overbeek, Neiman and Mike Rockenfeller on board. For van Overbeek, the race will be a curtain call with the Lizards. For 2010, he is moving to the Ferrari entry of Extreme Speed Motorsports in the ALMS.